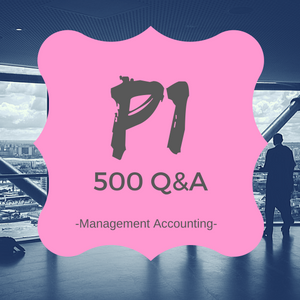 Full Package (500 Q&A) consists of at least 500 questions, that were prepared for YOU by a group of the world class tuition providers and the business experts. They have collaborated together in order to create high quality, relevant and entertaining questions with descriptive answers. It is important that the questions are prepared by a variety of people so in your learning process, you get exposed to the different points of view, different styles of questioning. In this way you become more agile in your thinking and therefore better prepared for the final exam. All the questions are original, and are based on the current, 2015 CIMA syllabus. The whole package is well differentiated. Because of the different question types and different levels of difficulty, we are also using scaled scores, just like on the real exam. The questions are based on the chapters from the official CIMA publishing materials. Everything is clear and transparent so you can focus on the areas you need to improve. This is the only practice kit available online with so many questions to practice! Increase your chance of passing the first time by practicing as many questions as possible. Practice makes better! Study mode where you see the answer straight after you press submit button, it's not time limited, however you can always see how long you have spent so far. You have a separate test for each syllabus topic. Number of questions was adjusted to meet the % weight of the syllabus, so you can practice what's important. Part D deals with risk and uncertainty and it covers 15% of the syllabus. 1 mini MOCK (30q randomly chosen questions from the study mode). You get here a real exam experience. You have the possibility to practice more than 500 questions per each paper (that includes all the questions from the study mode and 60 questions from the Mock exam with unique questions). If you want to get used to the real exam structure, atmosphere and time pressure, you can practice as many Mock exams (or mini Mocks) as you wish as the questions from there are randomly taken from the P1 syllabus. Each exam will be different, but if you covered the study mode, you might recall some questions. That's why you can check your knowledge and your preparation status for the exam by completing a Mock exam with unique questions. There is no repetition there and you can check your progress by looking at your detailed score. Again, the more you practice, the more you reflect on the questions you have completed and understand the reasons for questions you failed, the higher chance of passing you get. Still unsure if this is the best tool for you? Try our free demo with questions covering different levels, including the P1 paper.